The UA-1030T talking blood pressure monitor improves upon all of the innovations A&D medical has created over its 30+ year history. This fully featured monitor is equipped with innovations in cuff design, pressurization and deflation (3A technology). To speed up readings, users can preset pressure levels or set them to automatic. The UA-1030T offers the option of tricheck measurement which allows users to take three consecutive readings and receive an average, complying with the American Heart Associations latest recommendation. The UA-1030T has the option to give all readings and instructions verbally in English, French or Spanish. People resist taking their blood pressure because it can be uncomfortable; as a cuff constricts during a measurement, wrinkles form on the inside of the cuff causing the material to bunch up against the users arm and creating discomfort. The new SmoothFit cuff is designed to seamlessly conform to the users arm and give the most comfortable experience possible. It comes standard on the UA-1030T talking blood pressure monitor. The advanced warning system alerts the user to the most common problems while monitoring, and helps to avoid them. Each unit also comes with a trilingual instruction manual with log book, quick start card, storage case, AC adapter and 4 AA batteries. The blood pressure monitor stores your previous 90 measurements, allowing you to track your blood pressure and pulse over time. Its clock and time/date stamp make it easy to review and identify previous readings. The monitor also calculates the average of previous readings, so you can quickly get a sense of your progress. This monitor also boasts TriCheck measurement, which takes three consecutive readings and provides an average. This type of measurement is recommended by the American Heart Association. Approved by the European Hypertension Society, this monitor has been tested to ensure you get an accurate reading every time. This monitors blood pressure measurements are comparable to readings taken using the cuff/stethoscope auscultation method, within the limits of the American National Standards Institute. On a large display, the monitor shows your pulse, systolic and diastolic readings, and the time in easy-to-read numbers. In addition to displaying your readings, this monitor has an audio option that can give readings in English, French, or Spanish. Instructions are also available through this audio option. The monitor features a SmoothFit cuff boasting 3A Technology, for improved cuff design, pressurization, and deflation. The cuff inflates automatically at the press of a button, and you can even preset pressure levels to streamline testing. Unlike other cuffs that can cause discomfort during testing, the SmoothFit cuff is designed to conform to your arm for a more comfortable testing experience. The monitor features a pressure rating indicator that displays whether your blood pressure is high, low, or normal. While a trained professional should always interpret your blood pressure measurements, this monitor provides an easy way for you to see your pulse and blood pressure levels and understand how the numbers compare. In addition to providing blood pressure measurements, this monitor also displays a symbol that alerts you when your heartbeat is irregular. The monitor will provide you with an accurate blood pressure and pulse rate even if an irregular heartbeat is detected. 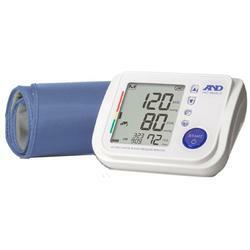 A&D Medical Premier Talking Blood Pressure Monitor, auto-inflate SmoothFit cuff, English/Spanish quick start card, storage case, four AA batteries, AC adapter, and trilingual instruction manual (Spanish, French, and English). Small blood pressure cuff for LifeSource blood pressure monitors. It is compatible with the UA-1020 and the UA-1030T. Fits arms 6.3 to 9.4 inches.